There are two important keys to obtaining a scholarship as a kicker or punter, talent and exposure. Some players get scholarships because they are on good teams and their teams are heavily scouted (exposure), and others because they performed so far above the rest that they couldn't be overlooked (talent). At Kicking.com, we can definitely help you improve your talent, but did you know we can also help you get more exposure? Sit back and let your performance on the field speak for itself, and gain exposure through stats, honors, recruiting service rankings (Scout.com, Rivals.com, etc) and word of mouth. It works well for those with players on their team who are also getting recruited, or if you have stats that are out of this world. However, if you don't get enough opportunities in a game, or have the right connections, or had a disappointing performance or two, or have a good publicist (parent or coach), forget about getting on this list of top prospects, and therefore getting any serious interest from colleges. We would consider this a very risky and passive approach to your college future! Write letters, send emails or mail in videos to all coaches you are interested in playing for. This method can also be effective, but it is very time consuming and can be very costly. You should consider that coaches receive hundreds of highlight tapes a year, and must decide which ones to go through, and how much time to spend on each one. If your tape does not give the coach a good idea of your talent quickly and make an immediate impression on them, then you have wasted a lot of money, and given a bad first impression! 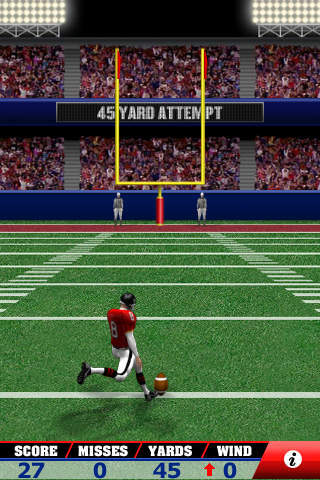 You will compete against kickers, punters and snappers in your region. Top performers will be invited to compete in Semifinal events, and those elite get invited to the National Finals to see who the best kickers and punters are across the country. Your stats and video from the camp will be posted online for coaches and recruiters to view. The best exposure out there! Create a personal webpage on Kicking.com, where you can post your stats, contact information and other vitals so that college coaches can view your profile and contact you. This is also a great way to see how you compare to other kickers and punters in your area, or around the country. When you contact college coaches, you can add your webpage link so they can see your updated stats throughout the season. We are also adding more options with national publications to take your stats and promote them on a weekly basis, through the Top Stats and Ranking of College Prospects features. The best option is to upload your highlight video to YouTube, then embed the code into your Kicking.com profile page. The best recommendations come from those who are experienced kickers and punters. If you have been trained by someone who has had success at the college or pro level, provide their email address in your profile, and we will post their honest assessment of your abilities for the coaches to read. You cannot read these comments, as they must be kept private from you, so that your expert can be completely honest. This also gives the coaches a good feeling that they are getting a true assessment of your skills, not a biased response because the expert is afraid of making the player or parents upset at their assessment. In addition, if the expert opinion is not accurate, then the expert will start to lose credibility with the college coaches. Our personal profiles can hold a lot of information, but there may be some things that don't get posted. Maybe you'd like to link to add more photos. Maybe you'd like to have a site to keep your family updated on all your activities. Either way, Kicking.com can help. Get started with your own domain name (i.e. http://www.yourname.com, a website built by Kicking.com), webspace to store your webpage files, and a professionally designed site for as low as $200. Contact Brion at brion@kicking.com for more information. Instead of waiting for the coaches at your top schools to find you and contact you, why not have Doug or Tommy do this for you? If you have received private lessons from Doug or Tommy, you are eligible to have one of them call 5 schools or teams of your choice on your behalf. A recommendation from an NFL veteran is one of the best ways to get your name at the top of your favorite school's wish list.